These beautiful windows are still in the original frames. 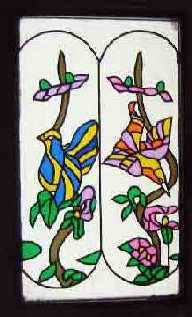 Artisticaly produced by outlining the the design in lead strip and staining the glass with a special dye. Very unusual items. 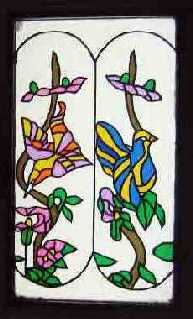 Beautiful Birds - in magnificent colours The glass has no chips or scratches and is in excellent condition. The frames each measure 32"H x20"W . The glass measures 29" x17 "